Color was spot on as shown in the picture. The quality was great for the cost of the rug. It fit perfectly in the space that I measured it for. I would purchase this carpet all over again! It is a great buy for sure!!!! Bring a bold splash of color to any room with this eye-catching modern rug. Beautifully hand-tufted from 100 percent wool, this gorgeous rug features an ivory floral pattern against a striking orange paisley background. The asymmetry of this stunning rug adds great visual interest to any space in your home. Beautiful rug, but it is not orange! This is a beautiful rug, but it was not the color I was expecting. It is definitely a dark, rust color...not orange. For most customers, this would probably be a good thing...its not bright or overbearing at all but our room has lots of tangerine accents, so it did not match. I ended up returning it and I must say I was extremely impressed with Overstock's customer service. The return process was speedy and painless. I plan to order another rug from them once my refund is posted. I do love the quality, size, design of this wool rug. My only complaint is the color that is displayed for the customer, DOES NOT MATCH the true color of the rug. The color is a lot lighter than the orange I thought it would be! The orange is very light rust and almost looks like a very faded orange. If the color was deeper or richer orange, i would have loved it! The design is beautiful, ivory flower is beautiful. Very comfortable, cushy rug. This rug changed me on rugs forever! It was the first hand-tufted rug I have ever owned. It is sturdy and thick, cleans up well, and has a great muted burnt orange color. Not as bright as the pictures show on this site. 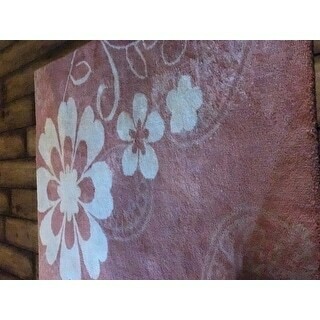 I purchased this rug because I wanted a thick wool rug for our baby's playroom. It is very good quality, and has provided good cushioning for his falls. The rug sheds a lot, and I am hoping we will not vacuum it into nothing. We have had it a month and have emptied the vacuum at least seven times. As far as the color is concerned, I find it a bit ugly. It is an orangish salmonish pinkish color, which I am finally getting used to. My husband for some reason is allergic to it and gets a rash where it touches his skin. It may be the dye because he has not been allergic to wool before. All in all, for a playroom, I like it. The rug was delivered so quickly, wrapped well, and is super heavy so I don't think I would have even returned it if I didn't like it. I did use a rug pad underneath to prevent slipping, but it probably wouldn't be necessary since it is so heavy. I received this rug on Wednesday and couldn't wait to get it out of the plastic. It is the prettiest rug I have ever owned. It is striling with the large ivory colors. It is a very substantial rug of excellent quality. I cannot say enough about how fabulous this rug is. I bought the 5' x 8' and it is perfect with my ivory colored couches. Love, love, love it! Quick shipping too! I had such high hopes for this rug! Its just what I wanted to add color to my family room. 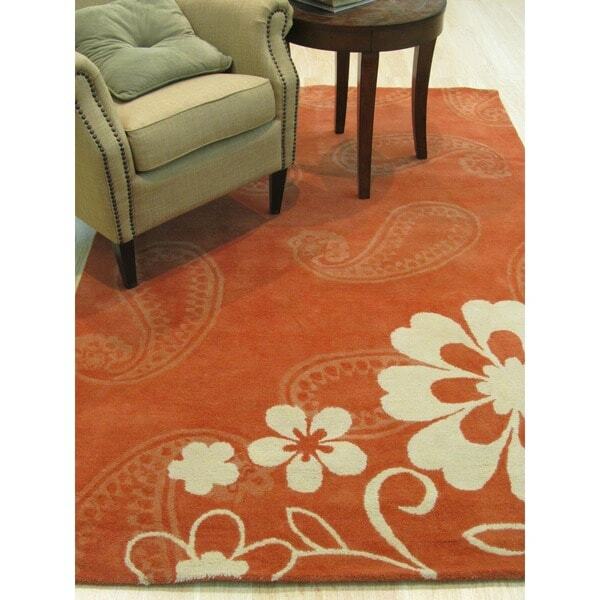 However I wanted the rug to be orange/rust color as pictured and described but it was not close! It was a SALMON color and had pink hues to it. It did not match any of my existing orange decor in the room! Wish I could have given it 5 stars. This rug was perfect for my open living room. I was a bit concern that the color would be too bright, but the orange is muted just enough to add unexpected color to my very dark hardwood floors. LOVE IT!!! I have had this rug for about 2 years now (I think), and it is as beatiful now as the day I got it. It stands up to being in the master bedroom (with big dogs and their nails), and doesn't really stain (we live in the country, with the big dogs). It does shed, but it is a wool rug. A wool rug that lays down flat and looks good . . . we vacuum regularly so I don't mind the yarn pilling on the surface. Design is well scaled! Really liked the color and the pattern, but the color faded significantly after a few months of vacuming. Continue to get pieces of the rug in the vacum canister. Color was not orange, it was Terra Cotta but works very well with the rest of my décor in front room. Love it. Very good quality. Color is more like a burned clay. Give special addition to my dinning room.I'm very happy with this buy. Would recommend to others. "What's the size of this rug?" Hello etanadjaja, this rug is 7'9 X 9'9. Hope this information was helpful. Thank you for shopping with us! "How do you clean this rug? Professional?"